Since there have been a few bee encounters lately I thought I would start a thread about yellow jackets. Yellow jackets in my opinion are the type of bees that we are most likely to encounter when geocaching. As the article I am including says, a single queen starts the process of building a new nest in the spring and natural food is abundant. Later, in the fall, the nest is strong, with many bees and natural foods are more scarce. This is when they try to eat our food at picnics and such. Attracted by meat and sweets, they come. Now, as for geocaching, we are likely to have the misfortune of discovering and maybe disturbing a nest that they have built in the ground, in a log, in a rockpile etc, which they will defend immediately. Many people do not recognize one bee from another and react to all bee encounters by swatting and moving quickly etc. I grew up around bees, my father was a beekeeper and I use to play with honeybees as a child, no kidding. This is how I taught my children to react when a bee comes around. First thing to remember is that the bee is not really interested in you, it is looking for flowers and other attractants to carry on normal bee business. So, if one lands on or near you just try not to move and it soon will lose interest. If you have to move, then move real slow so that it never perceives you as a threat. You can sometimes just slowly move your hand in the direction of the bee and this will make it move away. This of course does NOT work if you disturbed their home, now you are on their turf and they will be out to get you. Yellow jackets (Vespula species, Vespa species and Dolichovespula species) are considered beneficial around home gardens and commercially grown fruits and vegetables at certain times of the year because they feed abundantly on insect pests such as caterpillars and harmful flies. Unfortunately, in late summer and early fall when their populations peak, the yellow jacketsâ€™ normal insect diet disappears and their feeding habits become a problem to man. At this time of year, the yellow jacket has an appetite for much the same food and drink as those consumed by man. Also, yellow jacket stings can result in a life-threatening situation, especially if the person is allergic to yellow jacket venom. The yellow jacket worker is about Â½ inch long and has alternating yellow and black bands on the abdomen. Foraging yellow jackets are often mistaken for honey bees by the untrained eye because of their similar appearance and the fact that they are sometimes attracted to the same food source. Honey bees are slightly larger than yellow jackets and are covered with hair or setae which are absent on yellow jackets. Foraging honey bees can be identified by the pollen baskets on the rear legs that are often loaded with a ball of yellow or green pollen. The yellow jacket has a smooth stinger that can be used to sting multiple times, whereas the honey bee has a barbed stinger than can be used to sting only once. Yellow jackets are social insects that have a colony division of labor between undeveloped female workers, males and fully developed female queens. Newly mated queens are the only members of the colony that overwinter (survive the winter). In South Carolina, the yellow jacket colonyâ€™s life begins in April or May when the overwintered queen emerges and begins the establishment of a nest which is normally located in a soil cavity such as an abandoned mouse nest or hollow tree. Other possible nest sites are in buildings, including attics, porches, eaves or sheds. The queen builds a small paper nest and lays several eggs which hatch and mature to adult workers. This first generation of infertile workers undertakes all tasks of nest expansion including foraging for food, defending the colony entrance and feeding the queen and larvae (immature forms). The colony rapidly increases in size and the number of adult yellow jackets may reach several hundred by August. Nests are constructed of several layers of comb made of tiny bits of wood fiber chewed into paper-like pulp. During this peak population period, the colony produces reproductive cells that mature and provide future queens and reproductive males that eventually leave the nest for mating flights. Mated queens fall to the ground and seek out a protected overwintering place such as a brush pile, a hollow tree or a building. Males that have successfully mated quickly die. August 1991 that contained an estimated 250,000 yellow jackets. The nest was thought to have been re-inhabited for more than one year. The diet of adult yellow jackets consists mainly of food rich in sugars and carbohydrates, such as plant nectar and fruit. Also, foraging adults search for meat that is high in protein, such as insects and fish, which they chew and condition in preparation for larval consumption. The larvae in return secrete a sugary substance that is consumed by the adults. This exchange of food between the adults and larvae is known as trophallaxis. In late summer and fall, the normal food materials are in short supply, so the yellow jackets scavenge for alternate food sources which many times leads to major conflicts with human activities. Late-season foods include carbonated beverages, juices, candy, ham, bologna, fish, cakes, fruit, vegetables and ice cream. Large numbers of these pesky insects can totally disrupt a picnic and are often a nuisance around homes and outside restaurants. Yellow jackets are known for their presence around beehives in fall and will enter and rob honey if given the opportunity. They can become a major stress around weak honey bee colonies that cannot protect their food stores. Frequent removal of garbage and other waste products around picnic sites will reduce problems with yellow jackets. All food and beverage containers should be covered until served. Open soda containers should be checked carefully prior to consumption. Live yellow jackets have been swallowed by persons, resulting in a life-threatening sting in the throat area. Garbage can lids should be secured tightly to reduce foraging. Garbage cans and dumpsters can be sprayed with an insecticide labeled for that use. An insecticidal dust (Sevin 5% Dust) should be applied only at night when all foragers are inside the nest. The nest entrance should be identified and marked during daytime in order to be easily located at night. Yellow jackets are attracted to light, so do not hold a flashlight while applying an insecticide to a nest. Check the colony entrance the next day for activity and reapply again if necessary. If daytime control is necessary, the person should wear protective gear including a hat, veil, coveralls and gloves because returning foragers will likely attempt to defend the colony. Remember, yellow jacket colonies do not normally survive the winter, and the first hard freeze will eliminate most colonies. If a colony is located in an out-of-the-way place where human or pet contact is not possible, you may allow cold weather to freeze the colony. If this is not possible, purchase a container of pressurized insecticide labeled for yellow jacket or hornet control from the local feed and seed or hardware store, or garden center. The product should allow a straight stream of knockdown insecticide to be emitted from a nozzle. For complete nest elimination, spray the stream of insecticide directly into the nest entrance which will normally be located at the bottom of the nest. Check the nest for activity the next day and reapply if necessary. Protective clothing is highly recommended as stated in the previous section. 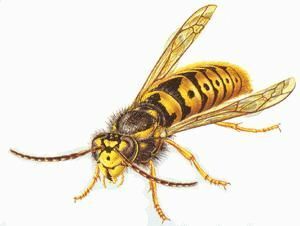 Elimination of yellow jacket nests in buildings can be most difficult. Use an insecticide that is labeled for yellow jacket control in buildings. Since yellow jackets are attracted to light, they may find another exit and you may cause them to enter the inside of the building, especially if control is done at night. If this happens, you must close off any alternate exits. There are several inexpensive non-toxic bait traps available for yellow jacket control, including the Wasp Trap, the Oak Stump Farm "Yellow Jacket" Wasp Trap and the Yellow Jacket Inn. Visit your nearby garden center or check out a gardening mail order catalog to investigate the availability of these traps. Traps should be placed around the perimeter of human recreational areas well in advance of outdoor activities. Traps may be placed along side dumpsters or restaurant loading docks. Most trap directions call for a reservoir to be filled with an attractant such as sugar water. Exhausted yellow jackets fall into the liquid and drown. Traps should be serviced daily to remove dead insects because the odor can become very offensive. Wash the trap with soap and water after several days use. Monitor the trapsâ€™ attractiveness to beneficial insects such as honey bees and alter the bait if necessary. Raw bologna has proven to be a very successful yellow jacket bait and it does not attract beneficial insects. Homemade Traps: A crude yellow jacket trap is made by hanging a raw fish or piece of liver (slightly diced on the exterior) by string about 1 to 2 inches above a container of detergent and water. The detergent will act as a wetting agent and eliminate surface tension which will improve trap efficiency. Foraging yellow jackets are attracted to the raw meat and will often become overloaded with food and fall into the water and drown. This method of yellow jacket control is not as efficient as nest elimination but it may help reduce the population to acceptable levels. "Bee Lining" for Fish Bait: Bee lining is a method by which a person may locate a yellow jacket nest by observing foragers as they return to their colony with food. A freshly caught small fish should be diced slightly on the exterior with a knife and hung in a tree about 5 to 6 feet off the ground. Foraging yellow jackets will be attracted to the raw fish and will chew off a tiny particle of the meat. By close observation, a person can follow the flight line of the yellow jacket back to her nest. The foraging yellow jacket will normally make a "bee line" straight to the nest which is often no more than 1,000 yards from the food source. Fishermen have been known to use this procedure to discover yellow jacket nests and use the grub as excellent fish bait. Precautions should be taken when working or playing in areas that are likely to be inhabited by yellow jackets. Logging equipment operators often disturb nests in the forest that can make their work very dangerous. A veil, hat and pressurized container of wasp or hornet spray are highly recommended during summer and fall. If a colony is disturbed, a person should slowly walk away with both hands covering the face to protect the more sensitive body areas. It is best to walk toward dense vegetation or enter a vehicle or building to avoid the stinging insects. Swift movements will only attract more yellow jackets. Persons highly sensitive to yellow jacket venom should always carry a sting treatment kit during outdoor activities. A yellow jacket does not leave a stinger in its victim, so therefore it can sting multiple times. To reduce swelling following a stinging incident, a person may use several sting remedies. A convenient material to place on the sting site is moistened table salt. Mound the dry salt on the sting entry point and moisten with a few drops of water. Leave the salt on the site for several minutes. This procedure must be applied within three to four minutes following the stinging incident to be effective. Yellow jackets and other stinging insects often get inside moving vehicles, which may result in a very dangerous situation. The driver should carefully stop the vehicle on the side of the road and all passengers should exit on the front passengerâ€™s side of the vehicle to avoid traffic. The driver should open all windows and leave the passenger doors open to allow the insects to exit the vehicle. Flying insects normally go immediately to the windows when inside a moving vehicle in an attempt to escape and are rarely in a defensive posture inside a moving vehicle unless provoked by an occupant. Persons should refrain from swatting the insect inside the vehicle.